Bonjour mes amis! Je vous présente le Caravelair Antarés 455 caravane. Sorry, I simply couldn’t resist doing that. 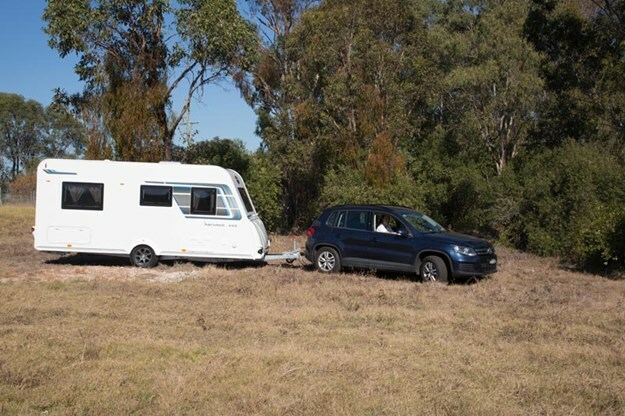 Despite the fact that in Australia and New Zealand I have looked over German, Italian, Spanish, Slovenian, Polish and British built RVs, this is the first time I have reviewed something Français. So whilst I’ll don my béret, I’ll revert to English because, apart from anything else, that will mean not typing le accents, comprendre? 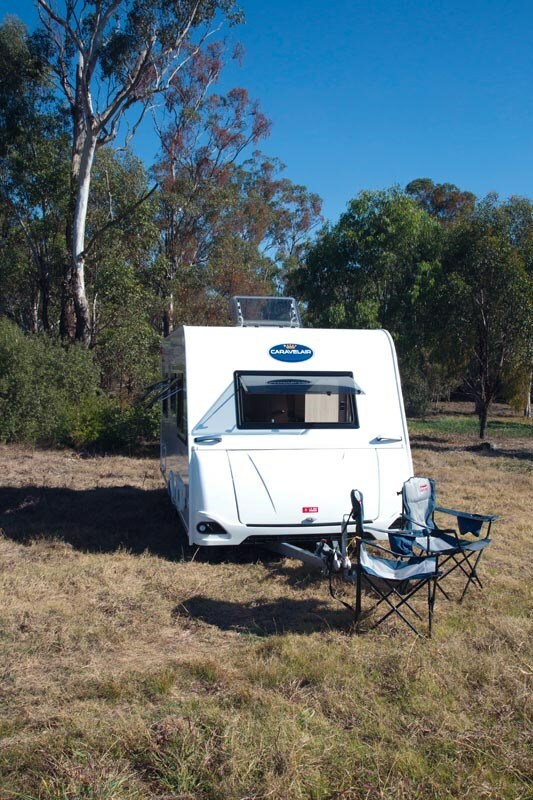 Caravelair Caravans have been imported into Australia by Carlight Caravans. 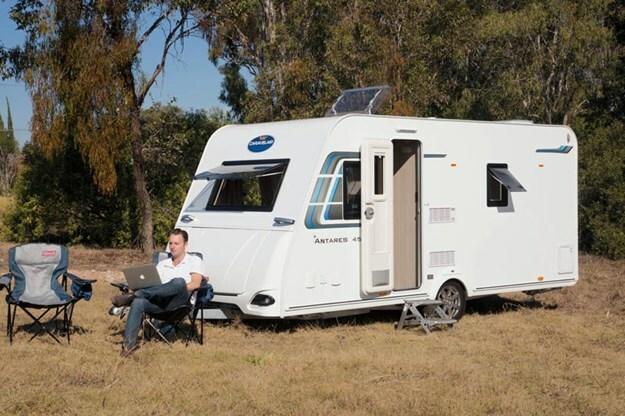 It’s rather aptly named because the company has already gained some experience with lightweight caravans with its Polish-built Euro caravans. 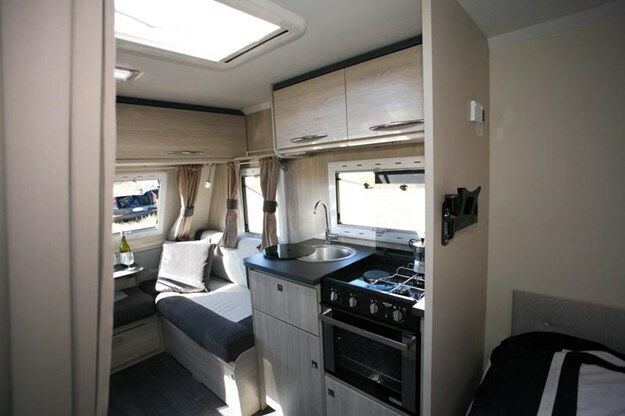 Just like the Euros, the Caravelair also fits well and truly into both the lightweight and budget categories. This Antarés 455 for instance has an external length of 5.35m (17ft 7in), a Tare mass of just 1050kg with a price tag of $43,990. Caravelair is part of the giant European RV manufacturing group Trigano, which includes names such as Adria, Auto-Trail, Benimar and Roller Team, so the company has plenty of RV experience. A look under the Antarés might suggest that Caravelair has indeed skimped on the steelwork but the Trigano-built hot-dipped galvanised chassis is very typical of a European-built rig, which is designed to be an integral part of the overall GRP (fibreglass)/XPS insulation body, rather than a totally separate support structure. The sub chassis area looks remarkably ‘clean’ with a minimal amount of cabling and pipework, and no water tank. Even the AL-KO Independent Rubber Suspension (IRS) has minimal components and this really dictates the ground clearance. Up front the van’s coupling is an AL-KO AKS 3004 stabiliser. External storage consists of a front boot and an offside bin door that provides access to the under-bed area. There isn’t a great deal of room in the front boot, but it does hold the spare wheel, gas cylinder compartment and a wheeled 30L grey water tank. That’s a great idea in environmentally sensitive areas. 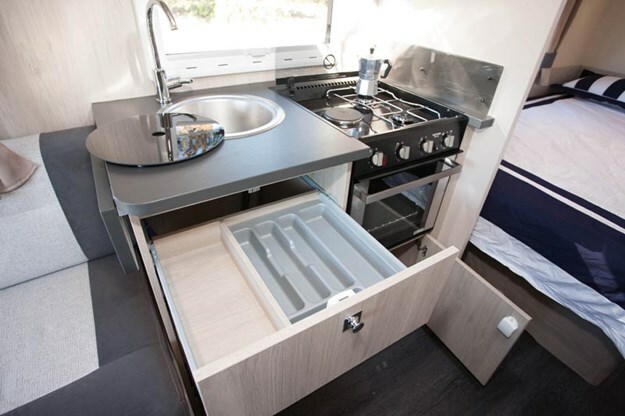 A look inside the Antarés reveals a few features often found in European designed caravans. For instance, the front lounge/bed area with an all-round window and even the aptly named (in this case) French bed in the offside corner with an adjoining combo bathroom in the other corner. 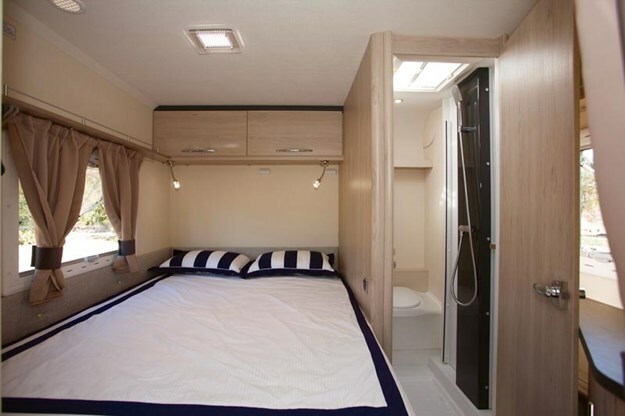 Interior height is a generous 1.95m (6ft 5in) and, although a faux timber finish is used on the cabinetry and even the walls, the overall light level is quite good thanks in part to a large Heki hatch in the middle of the van. Powerpoints are in mostly logical places and all have been converted from French to Australian fittings. One of the benefits of having nearly matching domestic voltages is that the wiring does not need to be changed. 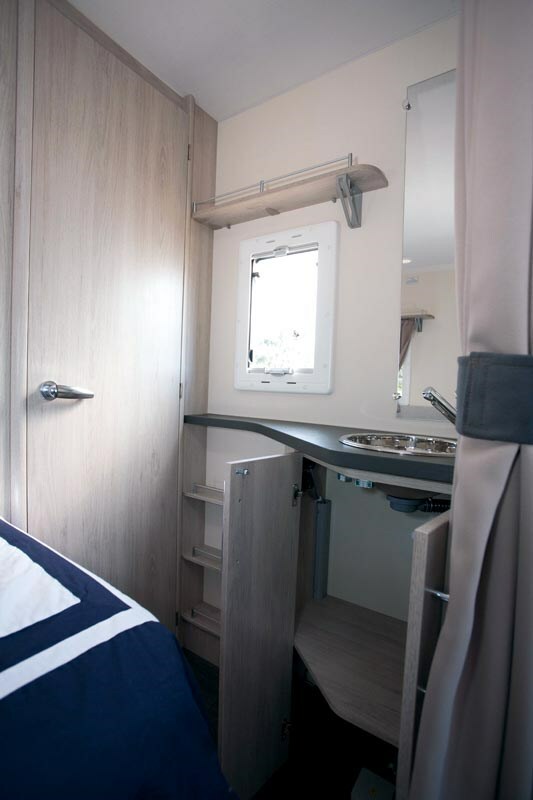 One of the benefits of this style of layout is that it is quite easy to have a four-berth van with the beds at either end. In the rear, the corner bed measures 1.93m x 1.3m (6ft 4in x 4ft 6in). It’s not something most manufacturers point out, but Caravelair advertise that its French-made mattress is CFC free, is anti-dust mite and also fully reversible. A curtain can be used to close off the bedroom from the rest of the van. 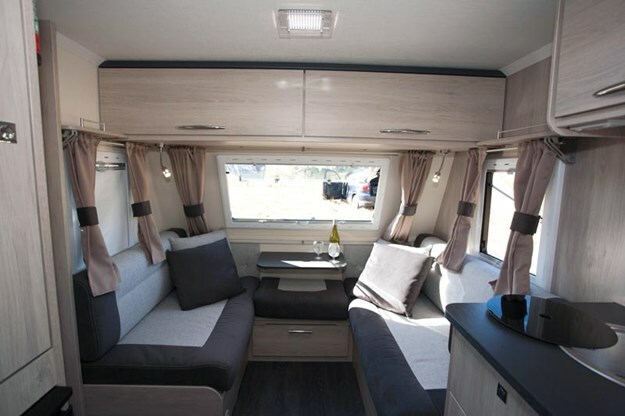 Up front, the lounge/dinette will fold down into a 2.1m x 1.5m (6ft 11in x 4ft 11in) bed — slightly larger than the rear bed and is made up by wooden slats between the front seats and infilling with the seat backs. A benefit of the front sideways lounge arrangement is that it’s a great place to relax and just watch the world go by. Instead of a fixed table, there’s both a drinks-sized shelf attached to the front wall and a freestanding table which is stored in the wardrobe when not being used. Overhead lockers run across the front of the van, rather than down the sides, thus minimising the risk of head banging when standing up or sitting down. For sitting down and putting your feet up, the offside person gets a longer lounge. European kitchens often have the characteristics of being small, with a round sink and a two/three burner cooktop plus a grill oven. There’s also usually a cupboard or two, a drawer and two overhead lockers. The Antarés kitchen bench certainly fills that bill with the addition of a hinged bench extension on the seat end. I suspect when washing up, a towel or something similar would be used to cover the adjacent seat. On the opposite side to the kitchen, an 85L three-way fridge sits below a reasonably sized wardrobe. With an adjoining bed, the bathroom isn’t going to be particularly big. In this case the bench styles cassette toilet is at the rear of the cubicle, with the shower further forward. Whilst the shower can be screened off from the toilet, it’s still a ‘wet’ bathroom, ie when using the loo, the shower floor may well be wet. Along the wall outside the bathroom cubicle there’s a small vanity cabinet complete with hand basin, cupboard below and a wall mirror. C’est une bonne caravane, I reckon, and an interesting range to be taken on by the Carlight importers. There are a number of models that will be available in the Antarés range, everything from a diminutive 3.95m (13ft) model to a spacious 5.85m 19ft) family van. If the 455 is any example, then the Caravelair range will be something to watch with interest.